Please feel free to add your plug to my plug board! That's why I put it there; for people to use! I hope everyone has a wonderful day! I just came across the most interesting page in one of my idea journals. When I was in high school, I had a lot of free time in class to just sit and read, draw, write... Whatever I was into at the moment. One morning, in an English class, I came up with the most wonderful idea! The idea is to have a delicious Bead Buffet! Oh how I would love to do this! I don’t know enough people in this area to pull of something like this, but I wanted to share my idea with everyone in case some of you might have the means to do your own Bead Buffet! The proceeds could go to a local charity or something. Each guest would pay a predetermined amount of money in advance for the food portion and entrance into the Party. They would also donate beads in advance to add to the buffet. When they arrive they will be given a small, clear take-out box, with a pair of mini chopsticks attached somehow to the handle. Or you could have the boxes sitting at the beginning of the buffet line, so guests could visit the buffet as they wish. 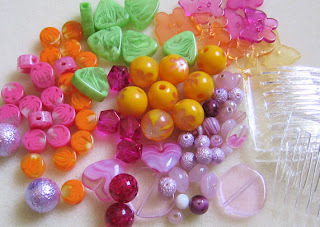 At one long table, or set of tables, we will have set up all kinds of beads (glass, seed, shell, gemstones, etc.) in all different kinds of containers – martini glasses, candy bins, glass bowls, etc. There will be appropriate scoops placed in each container, as the guests go through scooping the beads they want, they will pay per scoop (this will eliminate the ‘hogging’ of special beads). 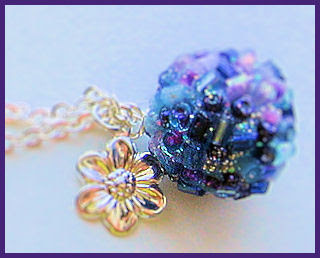 Polymer clay and Lampworked beads would be displayed and bought differently – still working on the details. There would also be piles of little plastic bags scattered throughout, to put the beads in before placing them in the take-out boxes. Seed beads to include a variety of Japanese and Czech beads in sizes ranging from 20/0 to 6/0; and maybe some 5/0s; also some seed bead mixes! 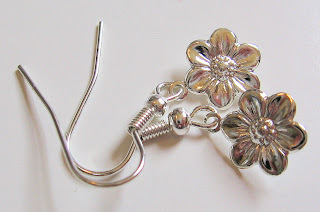 Vintage Lucite beads – Flowers, Leaves, Shapes, etc. 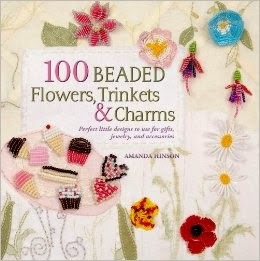 Real seed beads – beads from all over the world that are made of seeds! Of course there are many details that need to be worked out. I've just given the basics of my idea. It would be up to you all to work out the final event. A fun task to take on, I'm sure! I used to sit and imagine this for ages! What fun a Bead Buffet would be! Walking around, mingling with friends, scooping out beads into little bags... Add some yummy food, and you have the perfect afternoon treat! 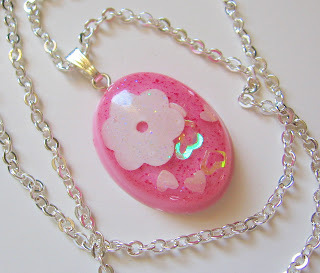 So what does everyone think of scented jewelry? I have a bunch of ideas for this, I'm just wondering which way I should go with it. I've already been selling aromatherapy jewelry at one of the local boutiques. It's doing quite well; everyone here seems to love it. I wear it a lot myself, too. I could do food/sweets shaped charms again, and scent those. Or I could to the felt/embroidered pieces and scent those... And then there's the matter of which type scents to use: florals, sweets, aromatherapy, etc. Any comments on this matter are greatly appreciated! I've also been working on my little Beaded Bitty Bugs... They are turning out so cute! I think I'm going to list one each week, in-between all of my other items. That way they will be more spread out, and everyone can look forward to the new colors each week! I think I've found a good place to get the 1.5mm silver plated ball chain to turn them into necklaces, now I just need to find a place to get those little attachment pieces. No pics of the Bitty Bugs yet; I still need to work out a few finishing touches. Soon though! Here's a couple of things that will be listed this week! Keep a lookout for them! I am just thrilled to pieces! 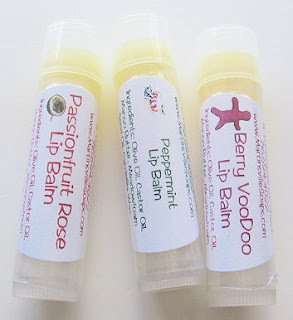 Last week I ordered some handmade lip balm from Martinsville Emporium. And this morning... I had a sweet little package waiting for me in the mailbox! Here's everything together. I ordered the Lip Balm 3 Pack, because I just couldn't decide on one flavor. (And then I took me about 45 minutes to decide on the three flavors! lol) Hey, they've got 36 flavors to chose from! And they all sound heavenly! You would've done the same! Chocolate Orange, Raspberry Plum, Peach Cobbler, Peanut Butter and Jelly, and even Buttered Popcorn! Holy yum! They also have a Lip Balm 6 Pack, for those that are even more indecisive than me! The flavors I finally decided on are: Peppermint, Berry VooDoo, and Passionfruit Rose. And they are all... Amazing. I've never smelled such intense flavors in a lip balm! Right now I am wearing the Berry VooDoo; it's a very juicy, fruity, berry sweet scent. I love it. The Peppermint is the perfect true mint scent. Not a lot of that sweet candy scent that makes you lick your lips and have to keep reapplying. It reminds me of the mint that my Mom and I used to grow in our herb garden. Wonderful! Passoinfruit Rose... Oh my gosh. This is definitely my favorite of the three. I chose this one first because I thought it sounded so unusual. The scent is so unique. A very delicious, exotic fruity scent, with a nice hit of floral. Yum... This is probably going to be the first one I run out of! The lip balm itself just glides on so very smooth, with great coverage. I didn't have to keep running it over my lips to feel like I had applied enough. And it doesn't feel slimy or gooey the way some balms and glosses do. Very nice! 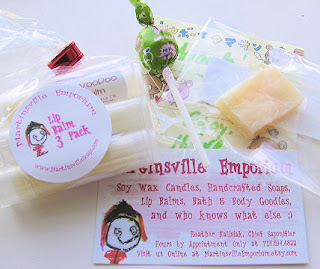 I will definitely be getting more of the lip balm, and I also noticed a sampler pack of little soap bars, too! Such a wonderful buying experience, I can't wait to tell everyone I know! 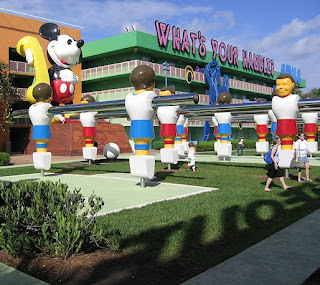 So, this morning I've been browsing Deb's site, trying to decide where to stay when we go to Disney World this fall. It's such a hard decision to make! 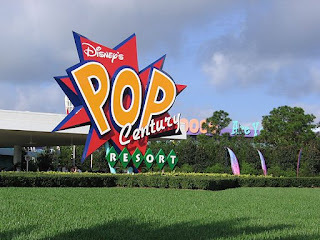 We really love Pop Century, and with the code we got in the mail, it would be super cheap to stay there. 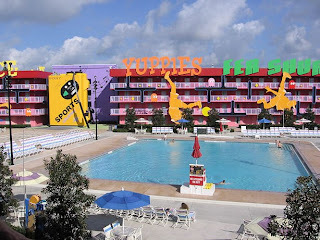 Not to mention it is a super fun resort! In other news, I have finally opened my Etsy shop! I'm a bit nervous about it! There are so many cool things on there; I wonder how I'm ever going to get noticed. I think for right now I'm just going to list one or two things each day, until I start getting sales. 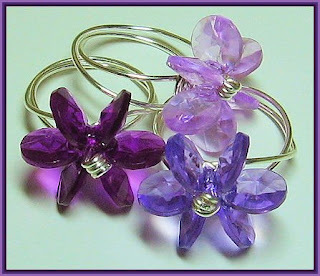 These are called Wishing Star rings. lol So named because when I was very young, I used these very same little 'snowflake' beads as 'wishing stars'. I remember giving them out to friends at school so they could make wishes, too! I think it's neat how beads have always been a part of my life, and now I can share them with others! Hmm... I better go fix some lunch so I can work on some new things this afternoon! I hope you all are having a wonderful day! I now have some things listed on Etsy! Woohoo! You can find my shop here! Ah... Spring Break! 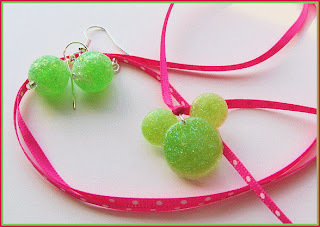 I'm using this time to set up a new Etsy shop, make some new goodies to list there, and perhaps start more serious planning of our Disney World trip this fall. If you would like one, let me know! 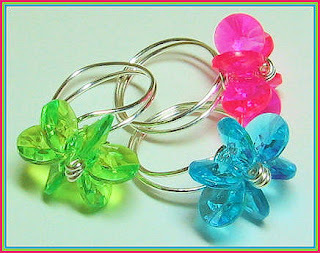 They are $12.00 each plus shipping! 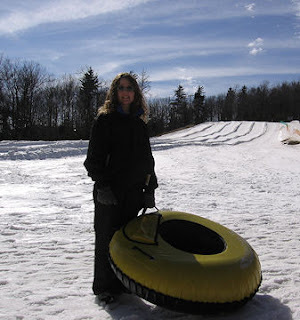 There was hardly anyone on the tube slopes. It was so fun! I could have done it all day! 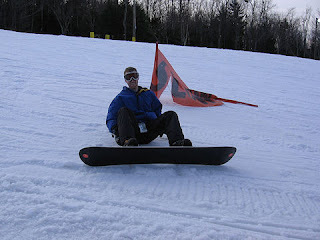 The Sweetie went snowboarding. He's pretty good at it! No, he didn't fall here! lol He was taking a break! I promise! This is the view from our room at the condo. It was sooo pretty! 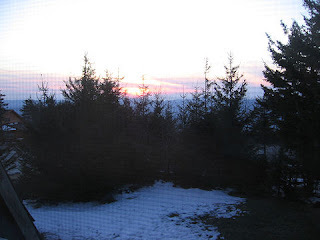 We could see lotsa deer in the back yard. 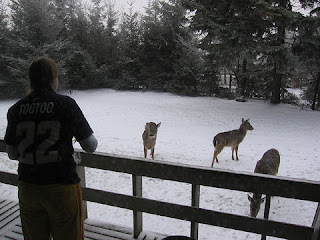 Here is my sister-in-law feeding veggies to a few of them. It was a great trip! Nice and relaxing! But now I'm definitely ready for a Disney World trip! I'm more of a 'let's go out and do stuff all day' person. Here is the 'test necklace'. I've got a few in one of the boutiques right now, to see if people like them. 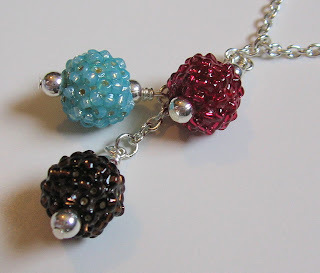 It's one of my beaded beads, paired with a matching silver charm, strung on silver chain. 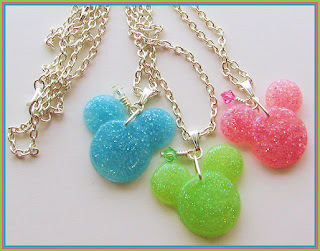 I call them Sweet Kinomi Necklaces. Kinomi is the Japanese word for 'berry'. I thought it was very fitting. :D Each Kinomi bead is about 5/8" wide. Today I'm going to work on some smaller ones to use for a different style necklace I have in mind, and maybe some bracelets. I'll keep you all posted with updates!